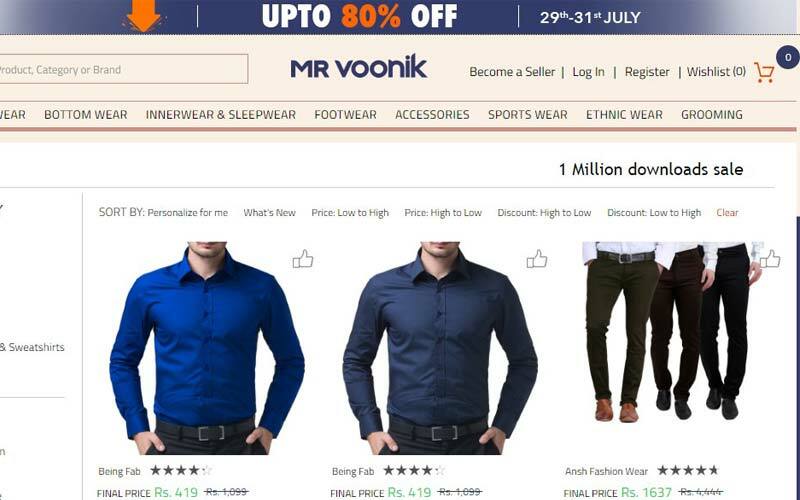 Mr. Voonik 1 Million Downloads Sale: One of the Men’s Fashion Shopping on Online is the Mr. Voonik. This Company has started in April 2016. This e-commerce company also has an expert on Women’s Fashion shopping by the name of Voonik.com. The Mr. Voonik completed its first quarter of the year (three months). Here today, the company offers a new Sale with the name of “1 Million Downloads Sale” from July 29 to July 31, 2016. Scroll down and get the more information about Mr Voonik 1 Million Downloads Sale. The Mr. Voonik 1 Million Download Sale gives various offers as Free Shipping Charge, COD offers. Get the chance to purchase the Mr. Voonik Products on less amount by using this offer period. It will end on 31st July 2016. Get the guidelines of Mr. Voonik Products Sale here. The company provides a YouTube Advertisement for this Offer. You may watch the Ad on YouTube if you have luck. It is appeared on sometimes only.